Part of our top 10 best portable solar chargers list, we have the Kenruipu solar charger at the top. We have seen countless positive reviews on Amazon.com of this product. Actually only 1% of buyers have given it a 1 star review. The other 99% have given it 5/5 stars. So it is no surprise that it holds a 4.9% rating on the site. So let's see what makes people love it so much. The Kenruipu solar charger is a power punch in a small case. Sizing at 3 x 6.2 x 0.87 inches and weighing in at just over a pound, 1.2 pounds to be exact. It is roughly the same size of a smartphone, which is great because it makes it very portable if you want to take it hiking, camping or any other outdoor activity. The smartphone sized solar charger has a massive 24,000mAh battery stuffed inside the frame. What is even more crazy is that charging it with a AC input only takes between 7 and 8 hours. This is because along with the solar charger, you also get an DC power adapter of 110v-240v. Now when looking at what you are actually going to use this solar charger for, which is probably charging your phone, prepare to be very happy. The Kenruipu solar charger features three USB charging ports, 5V/2.1A, 2A, 1A. So if you wanted, or needed to, you could charge three devices at one time without sacrificing power to either of the devices. Plus with the size of the battery, you could charge your phone up to 6 times on one charge of the power bank. And of course it supports quick charge technology. The solar charging capabilities on the Kenruipu solar charger are also pretty decent. The solar panel maxes out at 5V/1W. Also, multiple consumers of the product have reported that it only took about 2 hours of direct sunlight to charge the power bank up to 50%. Now with fluctuating sunlight, you can expect that the charge will be much slower. But if you find yourself on a gloriously sunny say, and you are not around any shade, the solar panel should work wondrously. One great thing about this solar charger is that the moment it gets access to sunlight, it begins charging itself. There is no need to turn it on, the solar self charging is completely automatic. While the outer casing is fairly durable, it is not waterproof. In addition, there is no option to attach it to a strap or backpack. So if you want to use it, you will either need to carry it yourself or leave it out in the sun for the solar charging to kick in. Of course you can just plug in your device and leave it charging in your backpack. But you can not use the solar capabilities on the go, at least not effortlessly. While there are not a lot of extra features in the Kenruipu solar charger, it does feature dual LED flashlights on the bottom. These can come in handy in the case of an emergency or if you are champing. The flashlights also have an SOS mode, if you are truly in trouble. The only other lights on the solar charger are pilot lights that indicate the charging level. As is the trend with many Amazon sellers, there is not much to be found out about Kenruipu. There is no company website or bio. However, the information I did find revealed that they have been selling on Amazon since 2017. Another trend found among many sellers. While they do not have any special rankings within the Amazon marketplace, they have never received a negative review of their products. The company on Amazon has a 96% positive rating, with the last 4% ratings being neutral reviews and not negative. The only two products available for purchase on Amazon are their solar charger and their pure power bank. Both of which have gleaming reviews. The Kenruipu solar charger is very compact and does not weigh an outrageous amount. This is great for portability as many people do not want to worry about trying to fit their power bank in with all of their other necessities. The power capacity is crazy big, 24,000mAh. That coupled with the fast AC charging speed of 7-8 hours gives it a big advantage over the competition. The solar cell is pretty capable. Various customers reporting that in direct sunlight, the power bank charged to 50% in only 2 hours. The solar panel is also sensitive enough to be charged from a desk lamp, but of course the efficiency there is much lower. 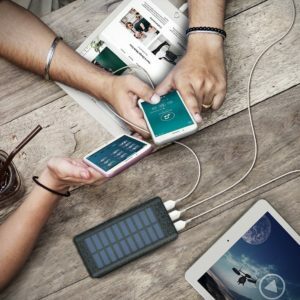 The Kenruipu solar charger features 3 USB charging ports. So you can charge 3 devices with equal efficiency. Great feature for your friends to take advantage of. The addition of the dual LED flashlights are pretty cool, even if they are not as powerful as other products with a similar feature. One great advantage of the Kenruipu solar charger is the fact that the solar self charging is completely automatic. As soon as the device hits sunlight, it begins charging the power bank. Making everything else very easy and hiccup free. Also a 2 year warranty with 24/7 customer service doesn't hurt. Unfortunately, the outer casing is not as durable as one would hope. Also, it is not waterproof, so you have to be pretty careful when bringing this thing along during any outdoor activity. There is also no hook or other option to attach it to a backpack to easy solar charging. The Kenruipu solar charger is a power packed device in a pretty small case. While it lacks the durability of other solar chargers, the solar cell and charging capabilities make up for it. You can charge the massive battery in 8 hours or under by using an AC input, and charge it adequately by using the power of the sun. However, you may not even need the solar panels because the battery is, again, huge. If you are looking for a solar charger to take a punishment, better look elsewhere. Otherwise, this solar charger is crazy powerful and portable. Basically everything you really need from a portable solar charger. Even the solar cell is good at it's job. Right now, you can find the Kenruipu solar charger for $40.99 on Amazon.com. It comes with a 2 year warranty and great customer service. For any more information you may need, or to read our other reviews of the best portable solar chargers, check out the rest of Green and Growing. Here are some top questions that I found for people seriously considering buying the Kenruipu solar charger. How long does the charger hold its charge? More than 3 months without an issue. However, to be safe, always charge it before you use it. Does it have overcharge protection? Yes it does. You do not have to worry about any damage coming to the solar charger or your devices from leaving them plugged in and charging for long periods of time. Besides waterproofing, are there any other element protections? Not really. It will not work well in extremely low temperatures.However, it does have a heat protection, that protects it while it is out in the sun for a long time.